This article submitted by Linda Stelling on 7/7/99. 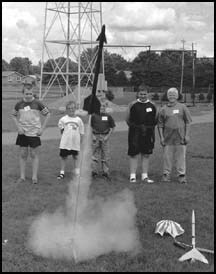 Youngsters assembled and launched model rockets and water rockets in a new summer recreation course last week. The course was open to second through sixth graders. More than 20 kids took part in the course. With the help of Jay Thompson, high school physics teacher, and Matt Dickhausen, community education coordinator, the participants on Thursday made a water rocket from recycled pop cans and plastic pop bottles.They then headed outside to launch their projects. The youngsters were anxious to see which rocket would fly the farthest. One water rocket flew the distance of the football field. On Friday they made their "Gnome" flying model rockets and launched them on the football field. Thompson told the students that they did not need to spend a lot of money on a rocket. He showed them rockets made from Christmas paper tubes and plastic bags.